My Xperiments: Vegetable Stew- Side dish for Appam. 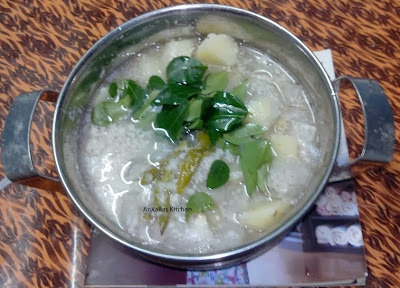 Vegetable Stew- Side dish for Appam. In a pressure pan put all the vegetables along with randaam paal. Add green Chillies, salt. Cook it for 2 whistles. Allow it to go off. Open the pan, add curry leaves and coconut oil. Keep it aside for cooling.At last add the onnam paaal. the delicious Stew is ready!!!!!!!!!!!!!!!!! You will get the coconut milk powder as a readymade packet in the market. but I don prefer that. i usually go for the home made one.Here is how u make coconut Milk..
Grate the coconut. Add 1 glass of mild hot water. Grind it to paste in mixie and drop the paste into a seiver. Squeeze the siever so that the milk falls off to another vessel. This is the onnam Paal.This should be always concentrated. Repeat the same procedure for getting randaam paal also.!!!! !